Planning for prom is no small feat. Whether you're on the committee for decorating or just looking for the perfect dress, creating a night to remember takes serious prep work. While many more retailers are offering digital catalogs in lieu of hard copies, you can still find several that offer print versions. Show friends and other committee members your findings with these print and online resources. There are many online suppliers for a variety of supplies that will help you to create the perfect theme and environment for your prom. The companies below not only have an online presence but several will also mail you a free prom catalog by mail upon request. Along with individual items, many of these offer complete prom decoration kits. Stumps has been around for years and their experience shows. They offer new themes every year as well as complete kits that will help you transform your space into the theme of your dreams. Individual items from tablewear to tickets are also available. Fill out the free online catalog request form (make sure to check the box for the prom catalog) or call 1-800-348-5084 with your catalog request. 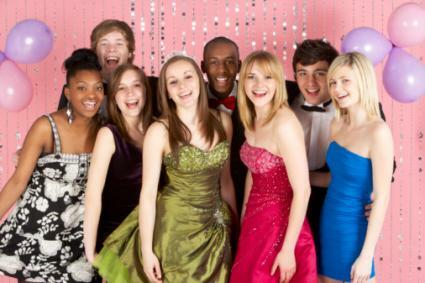 They have a low-price guarantee and offer a free prom planning checklist you can download. Prom Nite is a prom-specific online retailer that offers a free catalog and plenty of themes, from Hollywoord or Paris to Casino or Country. You'll just need to enter your information such as organization, name address, and contact information online. Alternately, you can request a catalog by calling them at 1.800.962.8006. In addition to prom decorations, favors, tickets, prom court items, and spirit products, they also offer prom theme kits that include full decor, including main decor, archways or awnings, and plenty of accents from lighting to balloons. They also offer free prom planners and guides you can download. The Anderson's Prom Catalog is full of great ideas for your prom, offering one-stop shopping for everything from photo backdrops and invitations to coronation props and favors. Just fill out the online request form and check 'Anderson Prom.' They offer a wide spectrum of themes and colors. You can purchase a complete package, but they also offer separates to match themes such as decade collections like the 1920s to the 80s, locales like Hollywood and Paris, and even trends like Shabby Chic. Check out their different categories to find something that will make your prom shine, or their blog for prom tips and ideas. Live chat is also available for help. You won't go wrong thumbing through a ShinDigz catalog. ShinDigz has lots of categories and they even offer a variety of selfie-photo set-ups, which could be a fun addition to your special evening. To get their catalog, just fill out the online request form (click the ShinDigz catalog box instead of Spiritline in order to get a look at prom items). The offer both full theme kits and individual products from balloon arches and aisle runners to favors and after prom products. They do offer student and military discounts. Be sure to check out their free planning advice option online too. While not every place that sells prom decor and supplies has a physical catalog, there are some great options you can browse online. Oriental Trading Company: Find a wide variety of prom themes and decorations, from classics like Under the Sea to fun retro themes like Awesome 80s. The selection ranges from backdrops and arches to candy and favors, so there's plenty to choose from. They offer both a low-price and a happiness guarantee, as well as free shipping promotions. Party City: This is a good option for basics and essentials, because there are many color choices in decorations, tablewear, balloons and more that could be used for a variety of different themes from simple to unique. Windy City Novelties - Light up the night with Windy City Novelties glow products. Glowsticks, drinkware, necklaces, bracelets and other fun items will step things up a notch on the dance floor. They have a variety of decorations available to match every theme. Party Supplies Delivered - Scan through lots of different traditional, current, and unique themes at Party Supplies Delivered. Great if you are mindful of your budget, many items come in multiples for additional savings. 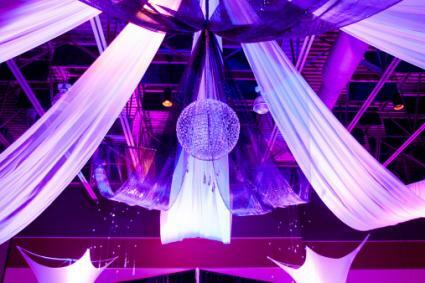 The Decorations section under Masquerade has lots of novelties to add a little sparkle and shine to your event. Beau Coup - Looking for something different as a favor for your prom? Look at Beau Coup for lots of ideas. From miniature gumball machines and place card holders to goodie bags and boxes, they offer little touches that will make big impressions. Do you need a catalog to help you choose a prom dress? Some stores still offer mail-order prom dress catalogs, and there are also plenty of choices to browse dresses online. This store features a huge variety of gorgeous dresses, all fresh and on-trend. Styles range from short to full-length and they offer sizes for a variety of shapes including petite and plus sizes. You can either download or order a hard copy catalog from Camille La Vie and find yourself at the height of fashion. Check the box to recieve the Social catalog for a look at a variety of short and long dresses ideal for prom. Camille La Vie also has store locations in many major cities. Impressions Bridal offers prom dress collections, including their Xcite and Xtreme dress lines. Though Impressions is a wholesaler and you can't purchase dresses directly through them, they do provide free prom dress catalogs upon email request. Just visit their contact page to put in your information and send the request. You can find a local retailer with their store locator tool. You can also find a number of great options for browsing prom dress collections online. Prom Girl: In addition to dozens of different dress styles in standard and plus sizes, Prom Girl also shoes and handbags. They have free style tips, ideas on preparing for prom, and even a complete online free prom guide. Shipping is free on orders over $49, and you can return dresses with a Return Authorization within 14 days for refund or exchange. Stores credit is given for final sale items that are returned. Faviana: Faviana has a large selection or different prom dress styles, including trendy, elegant, and celebrity-inspired looks. It's easy to browse the catalog by style, color, and more. Although you can't buy the dresses directly from their site, once you find a dress you like, you'll be directed to places to purchase. Jovani: Find beautiful styles ranging from form-fittng mermaid gowns to on-trend two-piece gowns in all colors at sizes at Jovani. Like Faviania, you can't purchase the dresses directly from the catalog site, but you'll have access to find local retailers to buy the dress of your dreams. David's Bridal: This well-known bridal retailer has a dedicated section just for prom dresses with plenty of variety in color, style, and size. They also have accessories available to purchase as well as free resources for prom trends, tips for the big night, and even a prom checklist. Standard shipping fees start at $8, and items can be returned within 14 days if they are in original condition with the tags attached. They frequently run discount specials so be sure to sign up to receive their emails. Henri's: This retailer has prom dress styles from dozens of different designers in sizes xxs through plus size. Find dress styles for all body types, from short, flared-waist dresses to innovative prom jumpsuits. You can buy dresses directly online with free shipping on orders over $100. They do not accept dress returns, however, so pay close attention to sizing measurements when ordering. If you're looking for the perfect special touch, you can also find places with catalogs for accessories for the big night. Around since 1952, the Ross-Simons catalog is filled with all kinds of beautiful jewelry. They offer rings, bracelets, necklaces in both single-strand and collar styles, charms, and a host of other classic looking pieces. You are sure to find something to match your ensemble. You can request a physical catalog or download and browse online. This store has a wonderful variety of baubles and beads with extremely reasonable prices. Claire's is perfect for adding some sparkle to your prom ensemble without breaking your budget, and they offer an online prom section with all types of prom accessories, from clutches to body jewels. My Party Shoes is focused on special-occasion shoes, with a complete prom collection. You can browse their online lookbook for the ideal footwear, then find a retailer near you (browse by state) to buy. Guys can also find places to get ideas for their best prom look. Tip Top Tux will send you a physical catalog upon request, or you can browse guy's prom attire with the online catalog. Just fill out the simple online request form and submit it (make sure to check the Prom catalog option). Looks include tuxes, suit styles, accories and colors, and shoe options. At Men's Wearhouse, you'll find a special section online dedicated to suits and tuxes in different colors and styles especially for prom. You can find styles to rent as well as options for purchasing tuxes. They also provide a handy step-by-step guide on how to rent your tux. 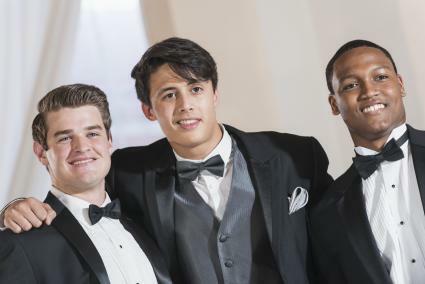 Perfect Tux has many options in prom suits and prom tuxes, and they also offer helpful tips such as how to match a guy's attire to his date's look. They also give simple steps on the rental process, and offer free shipping on orders over $99. From dress to decor, a catalog can make your prom planning almost easy. Make sure you check return policies, plan for emergencies, and give yourself plenty of time to receive ordered items in case you need to return something.